Stone Age; Bronze Age and Iron Age. Successive Ice Ages pushed the river Thames southwards from the Norfolk Wash to its present position, leaving today’s geology and land form – from the hills of Havering and Brentwood down to the low fens and marshes. The Thames Chase Walks can take you out into the countryside today, and a prehistoric petrified tree is on display at the RSPB Purfleet reserve. During the balmier interludes exotic animals like woolly mammoth, bison, elephant, monkey and lion roamed the open grasslands and some of their bones have been found and deposited into local museums. Early man, called Neanderthals, lived and hunted in the area and some of their stone and flint tools have been found and are now in local museum displays. Human hunter-gatherers started to arrive here in around 8,000 BC before the Continent was cut off from Britain. They started to settle and farm around 3,500 BC hunting deer, wild fowl and fish using crafted tools of flint, stone, bone, antler, and they made pottery bowls. The Beaker People brought their distinctive pottery and introduced metalworking. 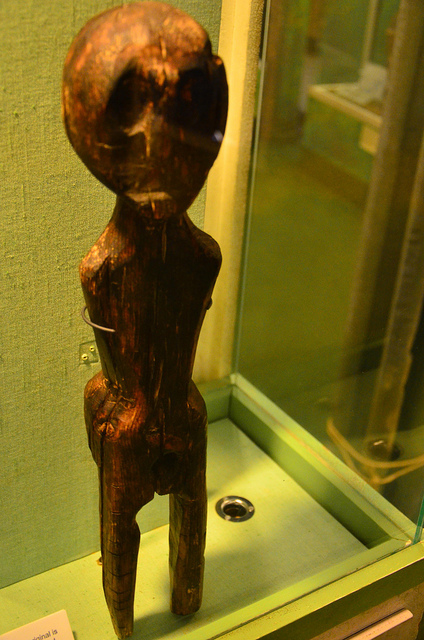 The Dagenham Idol, from around 2,250 BC is one of the oldest human representations found in Europe and is now on loan at Valence House Museum. Gradually around 2,000 BC people began making copper and gold, and later on bronze tools and ornaments. People were still hunter-gatherers but were also farming and raising livestock and constructing wooden track ways to move cattle out into the Thames marshes. They lived in Round Houses, and they built earth and timber monuments. Walk no. 5 goes to the Ingrebourne Valley and links with the London Loop and the Sustrans network. This valley was a Bronze Age landscape with several settlements and a bronze hoard found at Hornchurch and several more along the Thames around Barking Creek area. British Archaeology; The Ancient Monuments Society; Museum of London; Thurrock Museum; Havering Museum and Valence House Museum. Or by reading ‘From Ice Age to Essex – a history of the people and landscape of East London’ ISBN 1-901992-61-6; or ‘The Finest Prospect in All England – the archaeology of South Essex, UK’ by Essex County Council Heritage Conservation; and by visiting the reconstructed Iron Age settlement at Butser Ancient Farm in Hampshire.